President Trump has issued an executive order to begin repealing the Clean Power Plan and other Obama-era climate policies. So what are the impacts on the U.S. pledge to the Paris climate agreement? See the story in the New York Times for more. The New York Times used our data and analysis to show the enormous effect in the graphic story “Trump’s Executive Order Pushes the U.S. Climate Pledge Further Out of Reach.” Others are welcome to use the data as well. Contact us: info-at-climateinteractive.org. We explored what policy actions were intended to deliver upon the U.S. pledge to the Paris climate agreement, and which actions are now threatened due to the new administration’s slashing of climate rules. The data pull together analysis from Lawrence Berkeley National Laboratory (LBNL) and a report from the EPA and NHTSA, in addition to our own work (the C-ROADS simulation and Climate Scoreboard analysis). The New York Times used a version of this work previously in December 2015 for a similar story on what policies were under threat with Trump’s election. Historical net emissions data for the U.S. came from Global Carbon Budget for 2010–2015 for energy CO2. Land use, land use change, and forestry (LULUCF) emissions data for 2010–2014 comes from FAO. Data for the other greenhouse gases for 2010–2012 comes from EDGAR (4.2). F-gas data is only for 2010. We used C-ROADS to simulate the business as usual trend for the United States from the end of the historical data through 2025. We then employed analysis from “Assessment of the climate commitments and additional mitigation policies of the United States” in Nature Climate Change by Greenblatt and Wei (2016) of LBNL to calculate the impact of a wide range of federal and state actions on U.S. emissions. 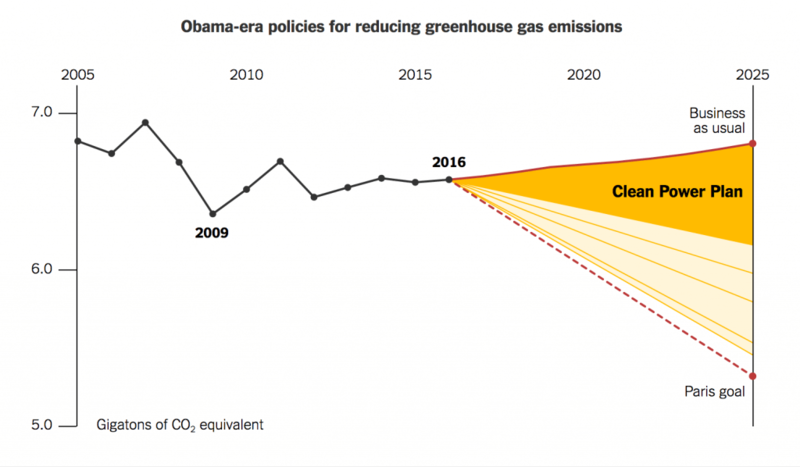 The paper outlines 18 different types of actions and estimated emissions reductions (see Greenblatt and Wei, Table 1) – these actions were aggregated into the two lines shown in the graphic. The LBNL study included the Obama-era fuel efficiency standards for cars and other light-duty vehicles in their baseline. Unfortunately, these standards are now under attack, so we separated them out in this latest analysis using the EPA and NHTSA’s report on the impact of those standards. It is expected that the fuel standards if they continued to be fully implemented would reduce 140 mtCO2e in 2025. Since the business as usual scenario we use from C-ROADS did not account for the fuel standards, we were able to include them with the impact from the policies that were included in the LBNL study. For other information on long-term U.S. emission scenarios, particularly those that are consistent with limiting global warming below 2.0°C please consult our analysis of mid-century strategies here.